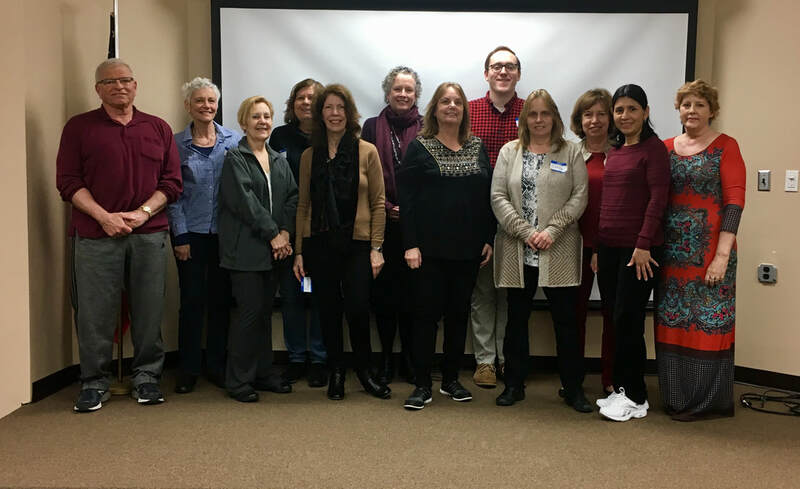 Congratulations to the following for completing the recent ESL Tutor Training Workshop: Maria Zuk, William Romollino, Jessiana Feliccia, Elizabeth Van Dyke, Sharon Belinsky, Barabara Mavrovitis, Peter Revie, Katherine Dronzek, Patricia White, Arpie Najarian, Susan Creighton, Allen Lowenstein, Shabbir Ladak, and Peter Fedorchak. Not pictured Phyllis Camens. 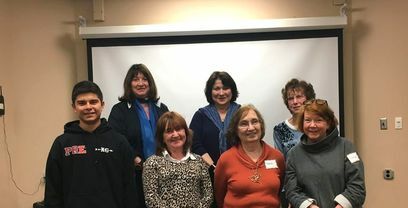 Welcome to our newly trained volunteer ESL tutors: Marie Guevara, Anthony Basile, Carol Scoton, Dennis Ruby, Donna Tirone-Kubicki, Brian Gatens, Sylvia Walsh, Regina Guth, Adriana Restrepo, Kim Minuto, Francine Mintzer-Dolber, Maria Gigliuto, Trish Bogucki, Sherri Nahum, Sasmita Mahapatra, David Singh and Joan Radke. 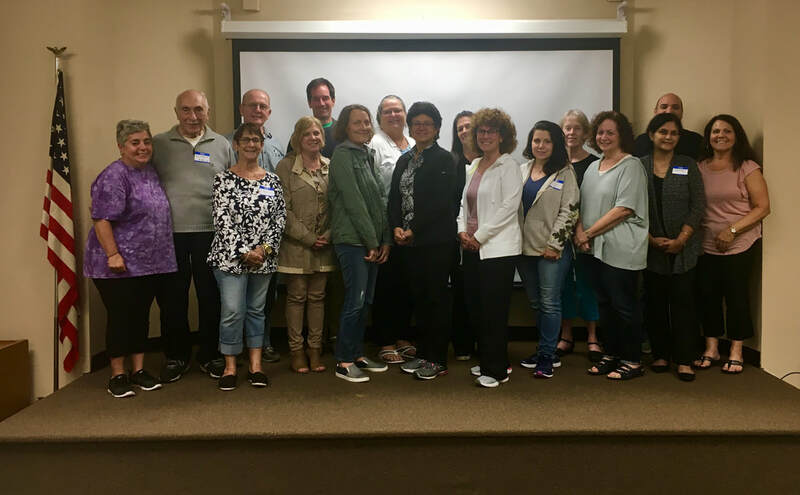 On June 13, 2018 Literacy Volunteers of Pascack Valley (LVPV) held its Annual International Dinner and Awards Ceremony. The special evening honored the students and tutors who work so hard towards English language literacy in the Pascack Valley. Throughout the year, volunteer tutors help hundreds of individuals improve their understanding and usage of the English language. The evening commenced with David Franz, Director of Hillsdale Public Library leading about 200 attendees in the Pledge of Allegiance. Mayor John Birkner, addressed the attendees emphasizing the importance of the program and the fact that Westwood is an inclusive and open community, welcoming everyone. Additionally, Westwood Councilwoman Beth Dell and LiteracyNJ CEO, Elizabeth Gloeggler attended to make the evening extra special. Len LoPinto, Director of Paramus Public Library, led the annual Literacy Board Elections with Scott Berkoben, David Franz, Francesca Ianora and Carmela Stark, renewing their 2 year terms. The officers are: Carmela Stark, President; Francesca Ianora, Vice President; Martha Urbiel, Treasurer; and Len LoPinto, Secretary. Nikki Dietel, former LV-PV Coordinator, President of the Board, and long-time volunteer was recognized for her outstanding hard work and commitment to LV-PV. It was noted that without her dedication, the program would not be what it is today. A celebration continued with many students sharing food from their native countries and a buffet catered by the Iron Horse Restaurant. Ramsey ESL Manager, Betsy Trum, was recognized for her devotion to the ESL program at Ramsey Public Library, and she was wished the best of luck in her impending retirement. Awards were presented to Stella Hernandez of Hillsdale and Laura Alvarez of Ramsey for Students of the Year. The Tutors of the Year were James Strohmeyer of Dumont, Kathleen Mundt of Hillsdale, Pat Manganello of Park Ridge, Donald Trapp of Ramsey and Rashida Tewarson of Westwood. 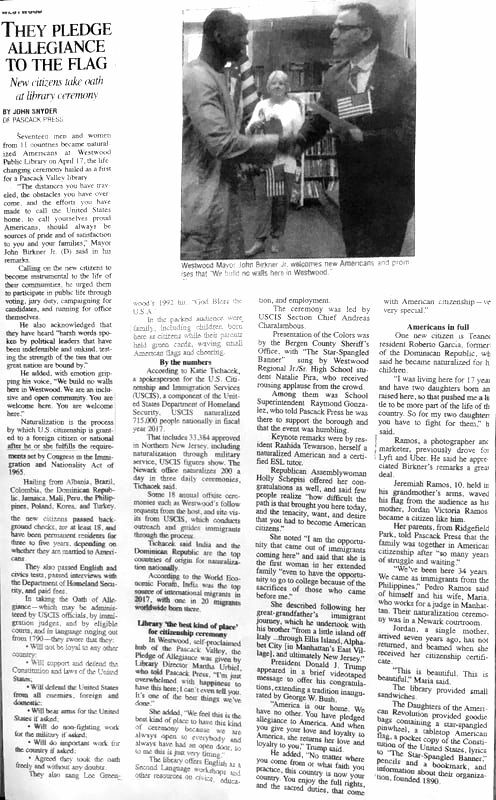 The 10 libraries affiliated with LVPV are Dumont, Emerson, Hillsdale, Mahwah, Montvale, Paramus, Park Ridge, Ramsey, River Vale and Westwood. 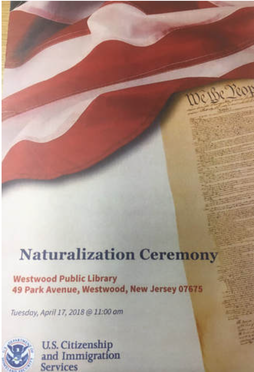 On Tuesday, April 17th, Westwood Library was the proud host of the Naturalization Ceremony with USCIS. Seventeen Pascack Valley candidates from 11 countries were sworn in as US Citizens during the ceremony after fulfilling the requirements set forth in the Immigration and Nationality Act of 1965. The ceremony commenced with the Presentation of Colors by the Bergen County Sheriff's Office, followed by Natalie Pira, Westwood high school student, singing the "Star Spangled Banner". Rashida Tewarson, LVPV ESL tutor and naturalized citizen, presented the keynote speach. Rashida reflected on her experience coming to the United States and integrating into the community. Rashida spoke of her ESL volunteer experience and her responsibility to teach not only the English language but the nuances of American life and culture to help newcomers feel connected to the community. She spoke of the duty of the new citizens to participate in civic life. Assemblywoman Holly Schepisi spoke of her ancestors journey from Italy and opportunities she received as a result. Mayor John Birkner addressed the new citizens urging them to participate in public life and stressed that Westwood is an inclusive and open community. Westwood Library Director, Martha Urbiel found it very fitting to have the ceremony at the library, stressing that the doors are open to all members of the community. Enjoy the photos and news article. Congratulations to our newly trained ESL tutors!! 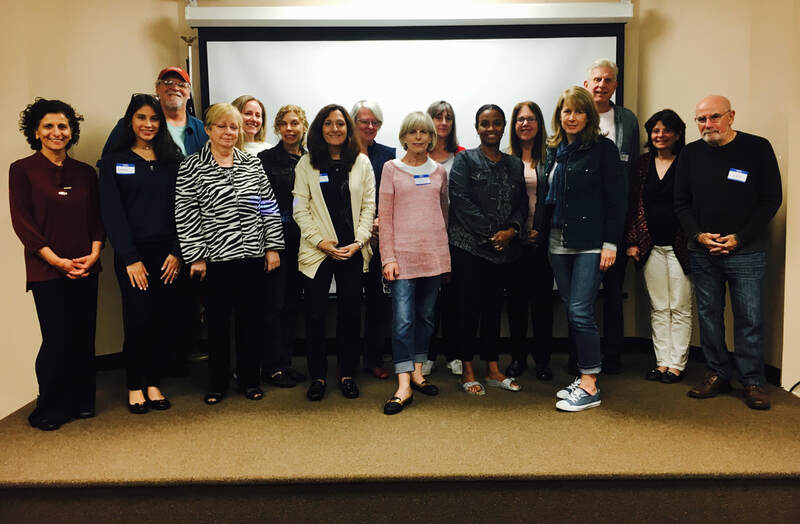 Steve Vegliante, Susan Seidman, Janet Parker, Marsha Shapiro, Dawn Tucker, Carla Hjelm, Laurie Lieberman, Robert Anderson, Donna Arera, Susan Terman, Marlene Mory and Donna Szot. 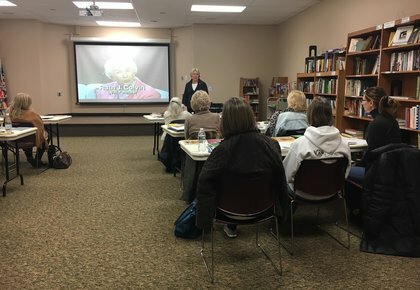 We recently completed the November 2017 Tutor Training Workshop. 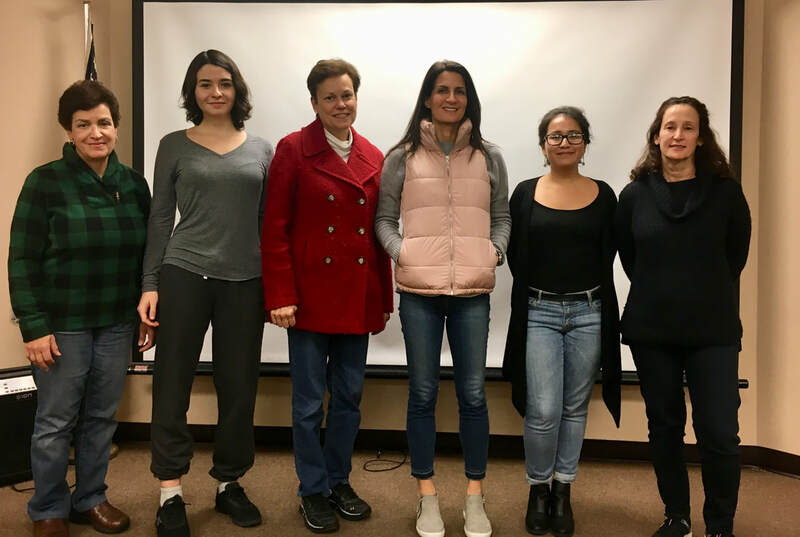 Welcome to our new tutors: Tina Grott, Francesca Reilly, Lourdes Sinkovitz, Rachel Zorrilla, Melissa Pesantes, Carol Pestone, not pictured: Cheryl Lotito. 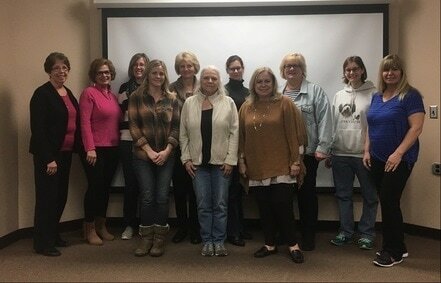 Congratulations to our newly trained ESL Tutors who completed the workshop on October 3rd 2017: Elizabeth Muroski, Deanna Lomaglio, John Ennis, Juliette Sobon, Caitlin Kummer, Lynda Leslie, Randi Beiman, Mary Terwedow, Andie Albies, Jane Battles, Carmen Martin, Merydith Raywood, Terry Powell, Ron Miller, Karen Diniz and Les Kaufman. understanding and usage of the English language. Scott Berkoben, David Franz and Carmela Stark. Barbara Stewart was honored for her long service as the President of the Board and her volunteer work with LVPV. A celebration continued with many students sharing food from their native countries and a buffet catered by the Iron Horse Restaurant. Awards were presented to Sergio Rada of Emerson for Student of the Year. The Tutors of the Year were Erik Barresi of Westwood, Harold Gainer of Hillsdale and Rene Schustermann of Dumont. Joan E. Paff of Westwood and Kathy Dryden of Emerson were recognized for 5 years of service, James Shih was recognized for 10 years of service and Jasjit Ahluvalia of Westwood and Claire Kinn of River Vale were recognized for 20 years of service. 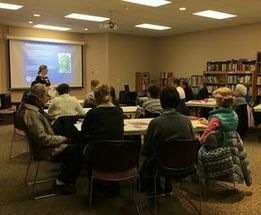 The 10 libraries affiliated with LVPV are Dumont, Emerson, Hillsdale, Mahwah, Montvale, Paramus, Park Ridge, Ramsey, River Vale and Westwood. Karima Lateef, Christine Cazzola, Jamie Flores, Rachel Flores, Susan Schink and Shannon Malone. CONGRATULATIONS TO OUR RECENTLY TRAINED TUTORS!! Judy Lehr, Barbara Gil Fries, Theresa Kennelly, Jennifer Natoli, Helga Burk, Ora Kiel, Andrea Lamendola, Celeste Mazzeo, Lorraine Thoms, Cynthia Loud and Suzette Draper. Not pictured Niti Jain. 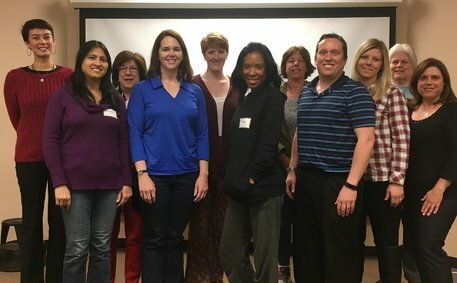 ​Welcome to our newly trained LVPV tutors: Venkat Abbaraju, Joanne Toal, Rita Lyons, Jessica Speck, Sandy Johnson, Cheryl Keenan and Nancy Morgan. Not pictured Victoria Arias, Rebecca Cohen and Hongmei Li. ​On October 27th, LVPV sponsored a session on the US Citizenship process. The USAIS provided attendees with invaluable information on the process. LVPV has up-to-date materials and information relating to US Citizenship. We completed an LVPV ESL Tutor Training Workshop in October 2016. Congratulations to our fifteen new certified ESL volunteers. 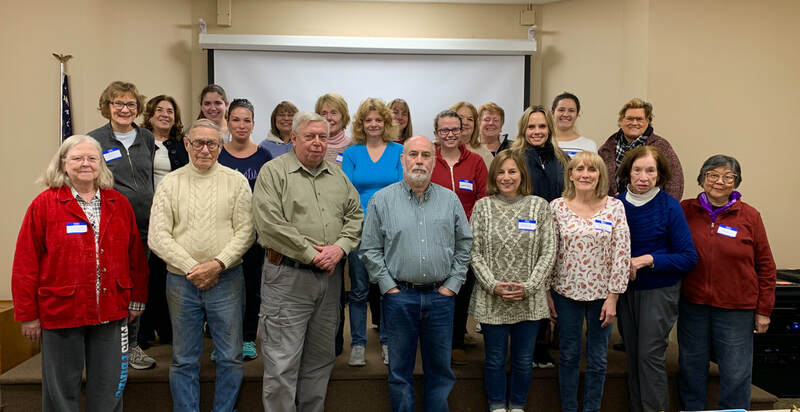 Pat Manganello, John Korchok, Therese Lowder, Susan Hiertz, Mary Jane McIlveen, Joseph Clohosey, Mary Squirini, Linda Shwab, Terri Raleigh, Jennifer Foster, Maria Nunes, Theresa Mustafa, Iris Weinhouse, Ryan Hayes, not pictured, Kathy Hedley. On May 18th, 2016 over 150 tutors and students celebrated Literacy Volunteers of Pascack Valley (LVPV)'s Annual International Dinner!! It was a wonderful evening honoring the students and tutors who work so hard towards English language literacy in the Pascack Valley. Throughout the year, these volunteer tutors help hundreds of individuals improve their understanding and usage of the English language. The evening commenced with the election of officers to the Literacy Board. The officers are: Nikki Dietel, President; Francesca Ianora, Vice President; Martha Urbiel, Treasurer; and Len LoPinto, Secretary. Board members are Scott Berkoben, David Franz, Barbara Stewart and Carmela Stark. A celebration continued with many students sharing food from their native countries and a buffet catered by the Iron Horse Restaurant. Awards were presented to to Juliana Kim of Dumont for Student of the Year. The Tutors of the Year were Denise Arlus of Ramsey, Clark Brinkerhoff of Park Ridge, Dorothy Consentino of Dumont and Michael Smith of Emerson. Joseph Bray of Ramsey, Clark Brinkerhoff of Park Ridge and Sue Seiden of River Vale were recognized for 5 years of service and Claire Hothem was recognized for 20 years of service. The 10 libraries affiliated with LVPV are Dumont, Emerson, Hillsdale, Mahwah, Montvale, Paramus, Park Ridge, Ramsey, River Vale and Westwood.